It’s hard keeping up with the Kardashians. Thankfully, it is not as hard keeping up with Mehgan James’s dating life---- Or so it seemed until Rob Kardashian decided to come into the fold. The Texas-native actress, best known by her on-screen nickname, The Texas Temptation, came to prominence on the ninth-season of the Oxygen channel’s popular reality series called Bad Girls Club. She's also well known on the VH1’s reality show called Basketball Wives LA. Before her stardom on Bad Girls Club, Mehgan was one of the finalists on an MTV reality series called 50 Cent: The Money and the Power. On 18 August 2018, Mehgan appeared on the show called Mind Your Business With1Manisha, where host Manisha Dellinger set up a meeting with Mehgan and her business partner, Tanya. Tanya revealed to Manisha that Mehgan owes about 11 vendors with the total amount of $11,000. Before Mehgan can even complete her sentence about not having a receipt, Tanya grabs her bag and brings out the receipt. Then Tanya continues to read off the boring list of transactions that Mehgan made. Manisha gives some commentary as to what kind of situation Mehgan is facing, stating that the vendors could sue her and she could lose her place at 800 west. Then Tanya breaks down in tears as she reveals that all her credits are gone and that she can't even afford a fabric for herself; she left everything including her job, work with her. Despite the work that Tanya did for her, the loyalty and love she showed for her, even when she started to cry, Mehgan showed no signs of empathy towards her. Finally, Mehgan being Mehgan, she has to have the last say, which she did as she said, "I'm always the bad guy, no matter what!" Born on 11 February 1990 in Houston, Texas, Megan grew up in Texas with six younger siblings. She attended the University of Houston. James, who stands tall with the height of 1.7 M (5.57743 feet), was a small-time model when she debuted on the Oxygen channel’s favorite reality show, Bad Girls Club (Season 1). Despite being eliminated in the first season of the show, she re-appeared in Season 9, where she had a fight with her housemates and left the show for the second time. However, her fight with her fellow housemates went viral, and because of that fiasco, she rose to stardom. More on Dating: Michelle Beadle Dating Boyfriend Steve Ends In 2016, Is She Married In 2018 (also her net worth)? What is Mehgan James’s Networth? Mehgan James enjoys the net worth of $400 thousand. She earned a massive revenue after being featured in the Oxygen reality television series Bad Girls Club: Mexico. Apart from that, she was a finalist to appear on the MTV reality series 50 Cent: The Money and the Power. She is also famous for movies such as Hogan (2017), The Fighters Prayer (2017) and Dumbish (2015). James previously dated a former Boston Celtics star, Kedrick Brown. She kept her relationship with her former boyfriend low-key. Although they’re not boyfriends and girlfriends anymore, the character proved to be a massive boost to her success. 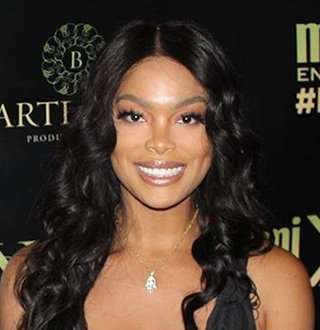 Aside from Kedrick Brown, Mehgan had reportedly dated NFL player, Kayvon Webster, former Denver Nuggets player, Quincy Miller, and former college football star, DeAndre Perry.To add for to the list, she was also reportedly involved with former NFL player Victor Cruz of the NY Giants. Is Rob Kardashian Husband-To-Be? Or Just Another Rumor? In June of 2017, a few months after Rob Kardashian’s break-up with his fiancee, Blac Chyna, reports surfaced that Mehgan’s new boyfriend was none other than Rob himself. With multiple outlets confirming their relationship, the rumored couple hadn’t gone public or made it official through their social media platforms. James was the first person to be linked with Rob after his split. After the rumors made its way to the Kardashians, Rob denied knowing James all together and stated that he hadn’t even met her. It was getting hard to keep up with the Kardashians. While it turned out to be another rumor, it was unlike any other rumor concerning Mehgan. The rest of the Kardashians made it clear that they didn’t want a girl like Mehgan for Rob; they wanted a more calm lady. That being said, since then, Mehgan hasn’t been linked with anyone else, nor there are any reports about her dating life. It seems even she couldn’t keep up with the Kardashians!